My obsession with scones began last winter after spending an amazing weekend in Burlington at a fabulous Bed and Breakfast called The Willard Street Inn. Each morning we’d awaken to the smells of freshly baked breakfast treats and without fail I managed to eat my weight in their delicious scones. My only other experience making scones was from one of those King Arthur mixes and they turned out like sugared hockey pucks (no fault of King Arthur Flour I’m sure, since I made those back in the days when the height of my culinary experience was heating a Skillet Sensation on the stove). 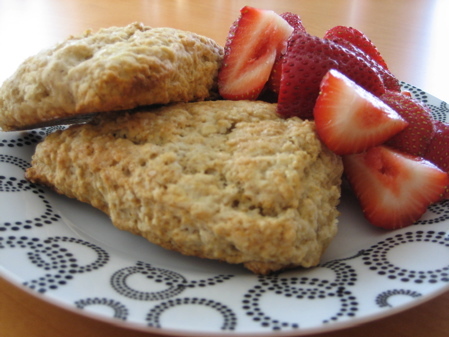 Now my memory isn’t perfect, but I really felt as though one version of the scones I had at the Inn contained oatmeal and brown sugar, so after doing a little internet research I found a scone recipe that contained those ingredients. 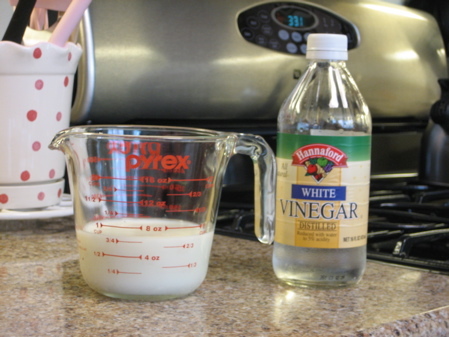 I didn’t have any buttermilk on hand, but I did have vinegar so I made my own buttermilk and hoped for the best. I also changed the brown sugar ratio to 1/3 cup plus 2 tablespoons so I would be assured of a slightly sweeter dough, and honestly I was incredibly happy with the results. Frankly, I was shocked at how well they rose, and I loved the taste and texture. The scones more than met my expectations and when paired with fresh fruit I could almost pretend I was back in Vermont being pampered again…until that yappie dog down the hall started barking and totally burst my bubble. 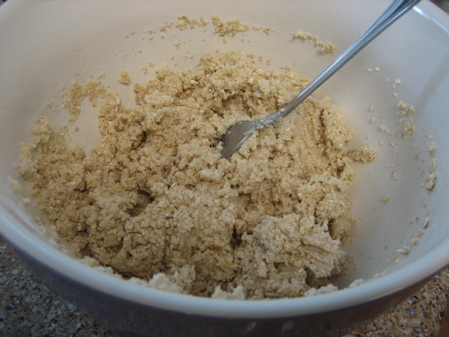 Sift together flour, 1/3 cup brown sugar, cinnamon, baking powder, baking soda, and salt into a food processor. 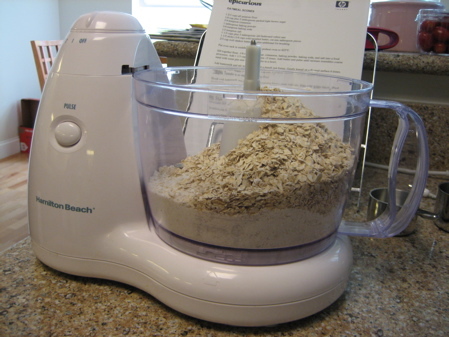 Add 1 1/3 cups oats and pulse 15 times. Add butter and pulse until mixture resembles coarse meal with some pea-size lumps. Transfer to a bowl. 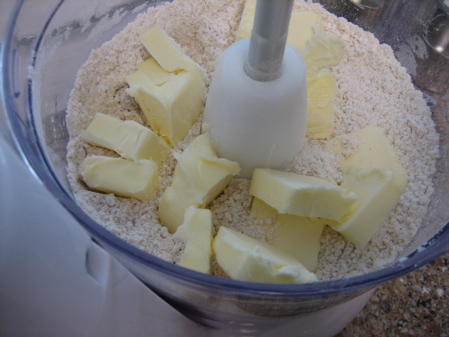 Add buttermilk and stir with a fork until a dough just forms. Gently knead on a floured surface 6 times. Pat into a 9-inch square (1/2 inch thick). Cut into 9 (3-inch) squares. Cut each square diagonally to form 2 triangles. Transfer to an ungreased baking sheet. 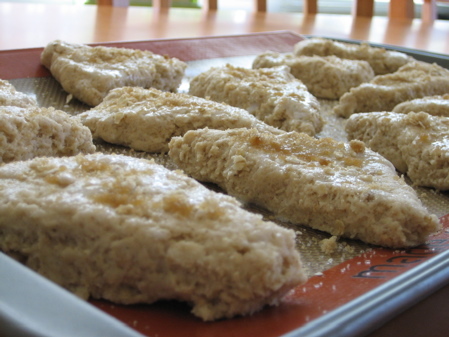 Brush with buttermilk and sprinkle with remaining brown sugar and oats. Bake until golden brown, about 16 minutes. You can use either. I think it just needs some sort of acidity to do the trick. 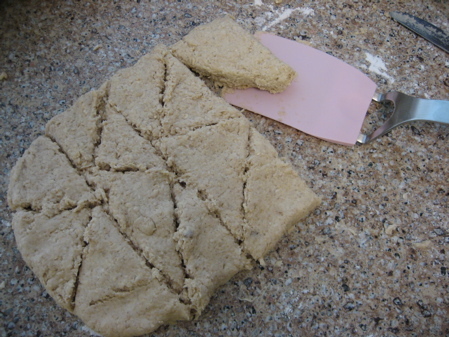 The scones look delicious, and I love how you included step-by-step photos! Alton Brown (Good Eats) made a comment that vinegar is often added to pie crust to reduce gluten formation. Using vinegar in place of lemon juice to make buttermilk might provide a little extra insurance that our scones don’t become tough. Clearly it also activates the baking soda. these look so wonderful, they won’t help the scone addiction I’ve been battling for a few days now. These look yummy! I have leftover buttermilk in the fridge right now, what luck. I think I will try with whole wheat pastry flour. Thanks for sharing the recipe and photos! Scones are one of my baking loves. It’s been too long since I’ve made some…hmmm. Here’s my favorite version (with both oatmeal and half & half) adapted from Cook’s Illustrated and via Cookie Madness: http://www.aminglingoftastes.com/2007/12/cinnamon-oat-scones.html. I usual like the buttermilk variety, but these rocked! I just made these for the first time and while they look lovely on top, the brown sugar that spilled over onto the baking sheet burned onto the bottom of the scones giving them a burned taste.